Look in the back corner of your refrigerator. Possibly you’ll find a container of chilled bacon grease. That grease is a form of rendered lard. What are you saving it for? It is currently a “wait in line” situation to get pig fat at the butcher, and past knowledge about rendering and use of lard is mostly shared through verbal instruction and practice. 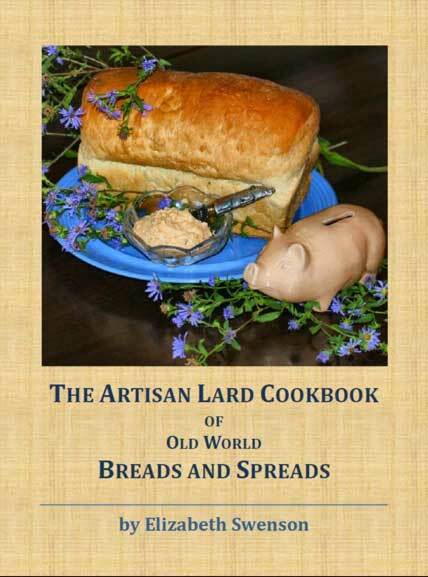 The Artisan Lard Cookbook of Old World Breads and Spreads helps preserve such expertise and provides a handy reference for future kitchens, but mostly it's about good old-fashioned food for folks who love heritage cooking. This great cookbook brings old world cooking techniques into the modern kitchen with a focus on natural, locally-sourced, non trans fat lard. Drawing from childhood experiences with her grandmothers and her Midwestern heritage, author Elizabeth Swenson has tested and compiled this collection of favorite international breads with associated spreads and fillings. The cookbook opens with a helpful introduction to home rendering procedures with color photography by Katherine Mary Nichols and historical notes to accompany every recipe. From Scottish Aberdeen Butteries with Browned Honey Butter to Russian Black Bread with Egg and Olive Spread, The Artisan Lard Cookbook of Old World Breads and Spreads provides a back-to-basics approach to sophisticated, organic cooking. Send us your review. It may appear here.